These qualities lend themselves to representing people, Robert says, because people want to know the truth. Robert believes that honesty is not only the best policy but the right way to live. Christian Trial Lawyers is not just a slogan to Bob, it is a reminder of whom we truly represent and must be prepared to answer to at all times. Although he finds it interesting to note how the firm has changed over time, he is more excited about the results. 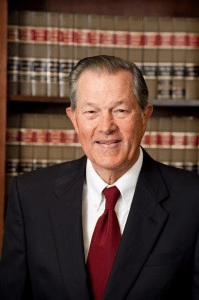 Robert Simmons, the firm founder, graduated from the University of Houston in 1964 with a Bachelor of Business Administration degree and from the University of Houston Law Center in 1966 with a Doctorate of Juris Prudence degree. After practicing law for about 8 years, he felt led by the Lord to form Brothers’ Brother Attorneys, a professional corporation, which continues today as Simmons and Fletcher, P.C., Attorneys at Law. Robert and Marilyn married in 1961 and are the parents of a son and three daughters and the grandparents of 7. A native Houstonian, he has been a member of the Board of Trustees at the College of Biblical Studies since 1981 and serves as a Deacon and Sunday School teacher at Fairfield Baptist Church in Cypress Texas. He still attends the Bible Study Fellowship class that transformed his life so many years ago.